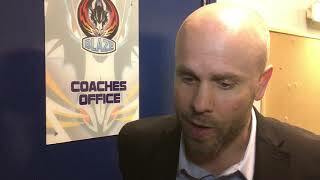 A year ago, the support of the Blaze Booster Club was instrumental in allowing the Genting Casino Coventry Blaze to install a number of large video screens into the dressing room in order to facilitate an improved learning environment for its players. This summer, the Booster Club have again offered their support to the club and its players by funding a season-long hire of a PhysioLab unit, which has been scientifically proven to reduce pain and significantly speed up athletes' recovery from injury. "We were fortunate to be able to use the PhysioLab unit in Budapest with GB. It was a crucial piece of equipment which helped the recovery of players in-between games during the busy schedule. "The PhysioLab unit works by administering ice and compression to different parts of the body to aid recovery, reduce pain and inflammation. Crucially, it’s portable which means we can take it on the road with us and use it on the bus after games. This will be extremely beneficial, especially on the long road trips back from Scotland. "It has already proved to be a valuable piece of equipment having used it on a couple of Coventry players who have been hurt or injured in the early season. Their recovery time has certainly shortened with the use of this machine." "We can't thank the Booster Club and its members enough for what they have allowed us to do since I took over the Head Coach role here in Coventry. As a club, we feel it important to ensure that we are using the funds raised by the Booster Club in the very best possible ways, and from the reports I have heard from Nicky and other medical staff, the PhysioLab unit will be really important to us as we go through the season. When injuries hit, we have no real choice in the UK but to play short, so anything that we can do to help treat our players better and get injured guys back in the line-up as soon as possible is a huge help." By joining the Booster Club for as little as £1 per-week, you will not only help to support the Blaze and its players to be the best that they can on the ice, but every month you will also be entered into a prize draw in which you can win some amazing prizes. For example, four lucky Booster Club members have recently won a season long Own and Loan Blaze jersey whilst during the summer a season ticket was awarded as a monthly draw prize. Others have included a trip to Belfast with the Blaze team, game-worn shirts, VIP SkyLounge tickets etc. 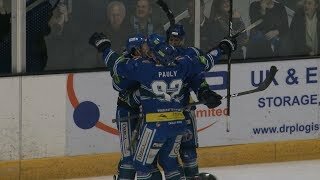 The Blaze Booster Club is independent of the Coventry Blaze, run by the fans, for the fans. If you would like to join for the small cost of just £1 a week and be in with a chance of winning one of the great prizes each month then please visit the Booster Club stand by the lockers in the Skydome Arena on a game night. They are a friendly bunch who will only be too willing to give you all the details of how you can be a part of this exciting club. Alternatively, you can get in touch with the guys by email (blazeboosterclub@gmail.com) or contact them on Twitter (@blazebooster). Regular updates of prize draws and winners etc are posted to their social media sites so make sure to follow them to keep up with all the news.